These shingles have never been cleaned before and as you can see they cleaned up great. Many of the buildings were located close to each other that allowed us to quickly move from roof to roof. All of the plants and grass had a dedicated ground-man watering and monitoring over-spray. This is a very important step during roof cleaning multiple units as you can make a big costly mistake very quickly. Peerless Pressure Washing Inc. guarantees all plants and vegetation during our large shingle roof cleaning projects like this one. What good are clean roofs if all of the plants are damaged? Not one plant was damaged or lost during this project. In this picture you can see how bright the shingles cleaned up. The Peerless Punch solution safely utilizes TSP. This keeps your roof bright and clean. All of our shingle roof cleanings come with a spot free warranty. 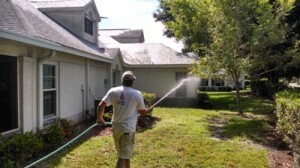 Peerless Pressure Washing Inc. 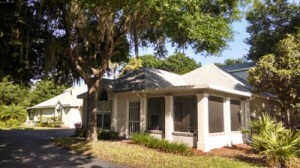 Provides services throughout the Tampa Metro Areas all the down to Sarasota. We are licensed painting contractors providing total exterior & interior services. Our professional crew has been providing shingle roof cleaning for over ten years.